Duncan has recently missed all of his lecturers, his serenade (TUKS) practice, not returned to his residence at Olienhout or spoken to any friends, church members or family members. I have been asked to look at Tarot for Duncan Allan who disappeared on 18 July 2011. Tarot can give glimpses of past present and future but it cannot be relied upon as being accurate 100 per cent in all details. I write what I see and one has to hope that it may be helpful. It is always wise to go to factual sources of information. When I cast this card for Duncan I had to think quite hard about it as this card is reversed. Reversed cards can change direction and I see that it is indicating that there is a direction of North West here. It may also suggest that the direction may have changed to South East. Here it shows that Duncan was setting out on a journey. I dont actually see he took anything much with him and if he did I do not see those things anymore in this card. It is reported that he went to pick up his car at a garage but though the Magician can be a handyman (man with tools) it might suggest that something is amiss. Either Duncan did not go to the garage or he did and found his car might not have been ready. I do not know all the story only what is printed above. There is no accusation here it is merely to say that if he went to the garage he might have been disappointed if certain things were not done. At the same time, when the Fool is reversed it can show someone who acts a bit recklessly but afterwards realizes it was a bit foolish. There could be another person in the cards that I am not able to describe but it can show that he was led up the wrong path by someone and only afterwards realzsed that things were deceptive. If he did pick up the car then something might have gone wrong with it because the Fool is walking not in a car and reversed we have this person who is walking sitting or standing by the edge of a road. There are ledges, rocks/cliffs or danger signs in the Fool card which suggest that if we dont watch where we are going we might fall over. It could indicate that he went off the road but again I need to know the full story. Someone may have suggested something to him but I just feel that its lies or there is a sense of cunning here and wiliness. He seems a nice lad so maybe he is not the sort to think that anyone would be anything different then at face value. So I do think he could be deceived. The impression of the Fool is 'not going anywhere' that's how it grabs me and I don't see that if he had his car it went very far?? or him for that matter. Obviously as a 'port of call' it would be assumed that the Garage would have been approached to see if they had seen him. Sometimes the Fool can reference 'being out of it' so drugs or alcohol could come in here, but from all points of view it does not seem to be the kind of thing that Duncan would be involved with.However, Tarot reports possibilities so I will mention it. I think there is some kind of link up with someone else someone he thought was ok and then found out they were not, either that or he thought his car was fine it was not. I have nothing to tell me in the press what happened other than this above story so all I can do is just put what there is. Now I am definitely 'travel off the list' so the car for me is a sticking point. That is the last place that he can be linked with in terms of where people thought he was going but his intentions might be changed here via someone else. I am stuck with the garage right now as I keep feeling there might be something about that. I feel like he was given some advice and it was not acceptable and I have a negative on this car. Looking at the above cards would reverse both Empress and the Emperor. The Emperor is often thought of as Authority This can mean Boss, Father or someone at the head of a business etc, but when it is reversed it can mean no relationship to that person in terms of physical so its not a person Duncan worked for and its not a biological father but it IS someone. This 'Someone' appears again in the card connected to where Duncan might be. There are very few directions on this card except for the number 4. Is his car a four door? I am feeling his disappearance is linked to it or because of it. I just see a lot of deceit here and a lack of respect and abuse therefore it seems to me that either this is a boy nobody really knows adopting these qualities or that he had someone around him that was being overbearing and very abusive. Assuming that there were no rows or discordance at home, I cannot imagine who this 'emperor' might be but it is not a good card. Linking to the Hierophant reversed, there may also be either a desire to break with the church or a link with someone who is 'ex-church' . It could show that he is in the vicinity of a church too, because the heirophant is organizations of the spiritual kind but at the same time it is about schools mentors and pupils, teaching. And I just see a link around all this. I think there is a kind of oppressive stalker attitude here where someone just keeps tabs on Duncan and I just feel that it is 'too much'. However this all pans out or presents itself I feel the situation is locked in here somewhere and the car still stands out as a problem to me. The Emperor reversed could be a dark haired person who just loses all sense of proportion. As the Emperor is linked to the Hanged man looking at that we have neptune strong in that card and can represent secrets outside the home perhaps. This card is reversed so shows this boy in suspension that he could get out of so I get the feeling of him maybe not far from water or near a place linked with a TREE name. I keep seeing the area of the Garage, I think Duncan tried to 'run away' or escape someone who was overbearing, dictatorial and oppressive as well as abusive and he did not want to do as they told him and ran the risk of going against their opinion causing great disrespect. The Garage is the reason given why Duncan went missing and it could play a different part then the reason. Asking when Duncan will be found Im told by tarot it will be within a ONE. It might be a week or within a week from Tarot being written. However, weeks is what I have. I also have the word 'Ashes' and seem to feel its linked to Home ground EITHER in the area still or not far. The suggestion is he would be found SOUTH . I also seem to have MAY here or MAYPOLE which has some subtle significance and might mean something to someone . There is a very masculine personality on this card and I feel a strong grasp is needed. Looking at a Map I was drawn North West to Farmers Folly Road. There is also a South Street there. This may have no significance whatsoever but I was looking in that direction as being part of a journey. This is a very brief overview Tarot has given. No doubt Tarot might have some things misconstrued however, I always write what I am given and prepared to accept that Tarot might have some things jumbled. But, we shall have to see how it turns out. I cannot guarantee anything I have been give as Tarot is not 100 per cent accurate. I hope this situation will conclude. I am extremely sad to find messages that Duncan has been found deceased. Tarot did feel that he would be found very soon. There are other validations in the Tarot but for the time being it is time to think silently of this young man and consider his family and friends. I am deeply sorry this has situation has ended in this way. Messages of condolence and support for Pretoria student Duncan Allan’s family flooded social networking sites on Tuesday after his body was found. The Tuks student appeared to have committed suicide in his car in a remote area about 30 kilometres outside Pretoria. He disappeared three weeks ago after picking up his car from a service garage. Hundreds of messages filled the Facebook page set up to help Allan’s family and police track him down. Many of them were calls to prayer, indicative of the young man who was described as a devout Christian and a regular church-goer. The police’s Annabelle Middleton said he was found with a bible in his left hand. She said, “There was a piece of hosepipe running from the gas outlet of the vehicle to the front passenger window..."
Speculation had been rife Allan got caught up in drugs, but Middleton said they are not investigating any drug-related incidents. “It seems like it was just a personal case of breaking down,” she added. A worker at a timber company has made a grisly discovery when he stumbled across the body of Pretoria University student Duncan Allan. 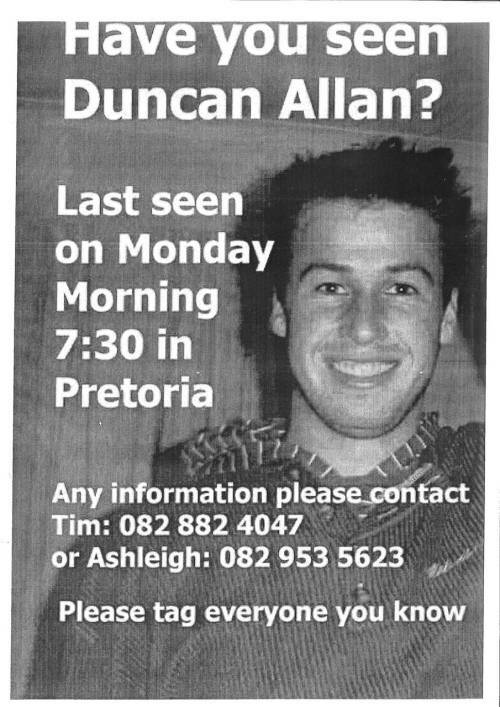 Allan, from Brooklyn, in Pretoria, was reported missing on July 25 when he failed to turn up for his lectures. A search for the BCom student ended tragically yesterday when Johnston Maguta, 29, found Allan's body inside his Jetta on a farm about 300m from Lynnwood Road, Pretoria East. It is thought that he gassed himself in the car on the day that he disappeared. Maguta said he spotted the car on Monday at about 10.30am when his team started harvesting timber in the active part of the Klipkop Farm. "I thought it belonged to other people working on the farm but I got suspicious when I saw it again today [Tuesday] at about 7.30am," he said. "I thought it might have been abandoned by criminals but something urged me to move closer and when I was about 5m away I was hit by a strong stench. "I saw a pipe leading from the exhaust into the front passenger window. The gap created by the pipe between the window glass and the door frame was sealed with masking tape, apparently to stop gas leaking from the car." Maguta said efforts to alert the police were unsuccessful but he remembered a flyer posted at a local petrol station about a missing student. "I took down the registration number of the vehicle and the make and walked to the petrol station to compare the information. Everything matched," he said. He called the cellphone number on the flyer, and Allan's father, Tim, answered the phone. "He wanted to know if I saw the car or his son and I told him that I saw both. He asked if he was alive but sadly I had to tell him the truth, that he was dead." Duncan's body was found today, in his car, on a farm outside the city. It appears he committed suicide. Not much information is available at this stage. I read your tarot reading the day you published it, and I just re-read it again now. Some things you mentioned that did not make sense at first now do completely. Our hearts go out to his family, I hope they find the answers regarding his death, and that they find closure and peace. Dear Empathy, Duncan was found deceased. Sad outcome. Thank you all so much for commenting and also giving me ideas of what Tarot was confirming. I am so very sorry for Duncan I really am and also his family. I concur also that I hope that the reasons this has all happened do come out in the open. 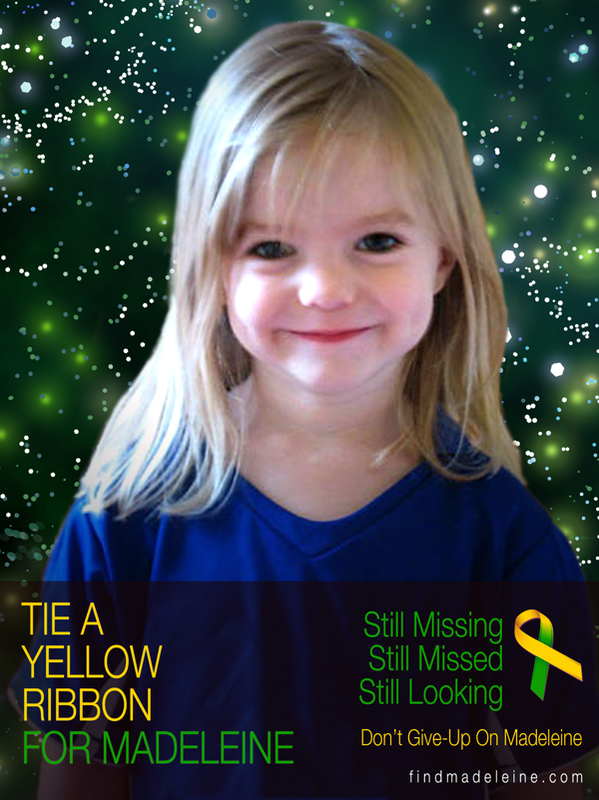 I do feel there is more to it but I wish to simply offer my deepest sympathies for the family at the current time. I just read over this case again and saw at your updated info you said that there were validations in the Tarot, but for the sake of the family you would wait to air it. What validations were these? I knew Duncan personally, and have believe firmly that his death wasn't an accident. He did not commit suicide.